I really like mid century modern. 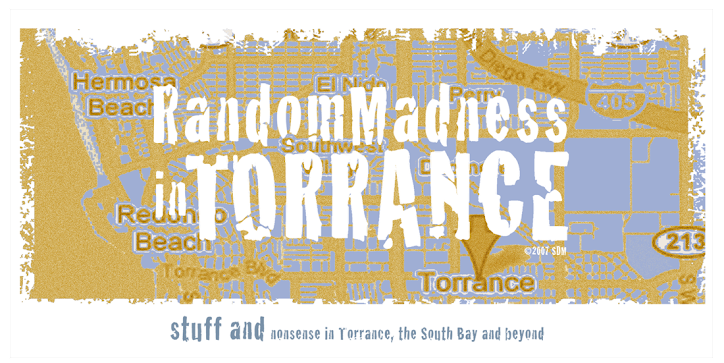 There are not too many commercial examples in Torrance. This is one is located at the corner of Carson Street and Arlington Ave. I'm sure any architects out there will correct my description of this structure, but it looks like an A-frame to me. I love the overhang on the roof, the wall of glass in front, and the rock walls flanking the windows. I think there may have been a ball light beneath the overhang at one time. 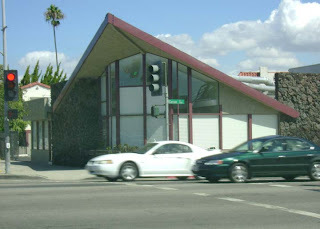 On Sepulveda Blvd, just west of Hawthorne, is another example that looks very much like this. Yet another one is in Gardena on Redondo Beach Blvd. (at least it was there last time I checked.) I think most if not all of them were originally real estate offices. I'm sick of the faux mediterranean/spanish style that seems like the norm these days. Give me a building that looks like this anyday. The Gewgaw, Where does it all go? Populux is cool, isn't it?